Figure 2. Noisy (roughly linear) data is fitted to a linear function and a polynomial function. Although the polynomial function is a perfect fit, the linear function can be expected to generalize better: if the two functions were used to extrapolate beyond the fitted data, the linear function should make better predictions. Overfitting and underfitting can occur in machine learning, in particular. In machine learning, the phenomena are sometimes called "overtraining" and "undertraining". The possibility of overfitting exists because the criterion used for selecting the model is not the same as the criterion used to judge the suitability of a model. For example, a model might be selected by maximizing its performance on some set of training data, and yet its suitability might be determined by its ability to perform well on unseen data; then overfitting occurs when a model begins to "memorize" training data rather than "learning" to generalize from a trend. To lessen the chance of, or amount of, overfitting, several techniques are available (e.g. model comparison, cross-validation, regularization, early stopping, pruning, Bayesian priors, or dropout). The basis of some techniques is either (1) to explicitly penalize overly complex models or (2) to test the model's ability to generalize by evaluating its performance on a set of data not used for training, which is assumed to approximate the typical unseen data that a model will encounter. Overfitted models … are often free of bias in the parameter estimators, but have estimated (and actual) sampling variances that are needlessly large (the precision of the estimators is poor, relative to what could have been accomplished with a more parsimonious model). Spurious treatment effects tend to be identified, and spurious variables are included with overfitted models. … A best approximating model is achieved by properly balancing the errors of underfitting and overfitting. Overfitting is more likely to be a serious concern when there is little theory available to guide the analysis, in part because then there tend to be a large number of models to select from. The book Model Selection and Model Averaging (2008) puts it this way. Given a data set, you can fit thousands of models at the push of a button, but how do you choose the best? With so many candidate models, overfitting is a real danger. Is the monkey who typed Hamlet actually a good writer? In regression analysis, overfitting occurs frequently. As an extreme example, if there are p variables in a linear regression with p data points, the fitted line can go exactly through every point. For logistic regression or Cox proportional hazards models, there are a variety of rules of thumb (e.g. 5–9, 10 and 10–15 — the guideline of 10 observations per independent variable is known as the "one in ten rule"). In the process of regression model selection, the mean squared error of the random regression function can be split into random noise, approximation bias, and variance in the estimate of the regression function. The bias–variance tradeoff is often used to overcome overfit models. With a large set of explanatory variables that actually have no relation to the dependent variable being predicted, some variables will in general be spuriously found to be statistically significant and the researcher may thus retain them in the model, thereby overfitting the model. This is known as Freedman's paradox. Overfitting/overtraining in supervised learning (e.g., neural network). Training error is shown in blue, validation error in red, both as a function of the number of training cycles. 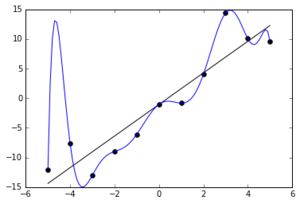 If the validation error increases(positive slope) while the training error steadily decreases(negative slope) then a situation of overfitting may have occurred. The best predictive and fitted model would be where the validation error has its global minimum. Usually a learning algorithm is trained using some set of "training data": exemplary situations for which the desired output is known. The goal is that the algorithm will also perform well on predicting the output when fed "validation data" that was not encountered during its training. When comparing different types of models, complexity cannot be measured solely by counting how many parameters exist in each model; the expressivity of each parameter must be considered as well. For example, it is nontrivial to directly compare the complexity of a neural net (which can track curvilinear relationships) with m parameters to a regression model with n parameters. Generally, a learning algorithm is said to overfit relative to a simpler one if it is more accurate in fitting known data (hindsight) but less accurate in predicting new data (foresight). One can intuitively understand overfitting from the fact that information from all past experience can be divided into two groups: information that is relevant for the future and irrelevant information ("noise"). Everything else being equal, the more difficult a criterion is to predict (i.e., the higher its uncertainty), the more noise exists in past information that needs to be ignored. The problem is determining which part to ignore. A learning algorithm that can reduce the chance of fitting noise is called "robust." A function that is overfitted is likely to request more information about each item in the validation dataset than does the optimal function; gathering this additional unneeded data can be expensive or error-prone, especially if each individual piece of information must be gathered by human observation and manual data-entry. A more complex, overfitted function is likely to be less portable than a simple one. At one extreme, a one-variable linear regression is so portable that, if necessary, it could even be done by hand. At the other extreme are models that can be reproduced only by exactly duplicating the original modeler's entire setup, making reuse or scientific reproduction difficult. The optimal function usually needs verification on bigger or completely new datasets. There are, however, methods like minimum spanning tree or life-time of correlation that applies the dependence between correlation coefficients and time-series (window width). Whenever the window width is big enough, the correlation coefficients are stable and don't depend on the window width size anymore. Therefore, a correlation matrix can be created by calculating a coefficient of correlation between investigated variables. This matrix can be represented topologically as a complex network where direct and indirect influences between variables are visualized. Underfitting occurs when a statistical model or machine learning algorithm cannot adequately capture the underlying structure of the data. It occurs when the model or algorithm does not fit the data enough. Underfitting occurs if the model or algorithm shows low variance but high bias (to contrast the opposite, overfitting from high variance and low bias). It is often a result of an excessively simple model. … an underfitted model would ignore some important replicable (i.e., conceptually replicable in most other samples) structure in the data and thus fail to identify effects that were actually supported by the data. In this case, bias in the parameter estimators is often substantial, and the sampling variance is underestimated, both factors resulting in poor confidence interval coverage. Underfitted models tend to miss important treatment effects in experimental settings. ^ Definition of "overfitting" at OxfordDictionaries.com: this definition is specifically for statistics. ^ a b c Everitt B.S., Skrondal A. (2010), Cambridge Dictionary of Statistics, Cambridge University Press. ^ Claeskens, G.; Hjort, N.L. (2008), Model Selection and Model Averaging, Cambridge University Press . ^ Harrell, F. E., Jr. (2001), Regression Modeling Strategies, Springer . ^ Martha K. Smith (2014-06-13). "Overfitting". University of Texas at Austin. Retrieved 2016-07-31. ^ Vittinghoff, E.; McCulloch, C. E. (2007). "Relaxing the Rule of Ten Events per Variable in Logistic and Cox Regression". American Journal of Epidemiology. 165 (6): 710–718. doi:10.1093/aje/kwk052. ^ Draper, Norman R.; Smith, Harry (1998). Applied Regression Analysis (3rd ed.). Wiley. ISBN 978-0471170822. ^ Jim Frost (2015-09-03). "The Danger of Overfitting Regression Models". Retrieved 2016-07-31. ^ a b c Hawkins, Douglas M. (2004), "The problem of overfitting", Journal of Chemical Information and Modeling, 44.1: 1–12. ^ Cai, Eric (2014-03-20). "Machine Learning Lesson of the Day – Overfitting and Underfitting". StatBlogs. Leinweber, D. J. (2007). "Stupid data miner tricks". The Journal of Investing. 16: 15–22. doi:10.3905/joi.2007.681820. Tetko, I. V.; Livingstone, D. J.; Luik, A. I. (1995). "Neural network studies. 1. Comparison of Overfitting and Overtraining" (PDF). Journal of Chemical Information and Modeling. 35 (5): 826–833. doi:10.1021/ci00027a006. Tip 7: Minimize overfitting. Chicco, D. (December 2017). "Ten quick tips for machine learning in computational biology". BioData Mining. 10 (35): 1–17. doi:10.1186/s13040-017-0155-3. PMC 5721660. PMID 29234465.